If you couldn’t perform Sharda Pujan on Diwali day then this is the best day to perform the pujan of the new books and ledgers. On this day, people are known to meet one another to renew lost ties and distribute sweets amongst themselves to add sweetness in their relationships. ‘Labh’ literally means benefit and this is the day to seek all kinds of material benefits like - a good job, money, good in-laws, good health etc. The scriptures suggest that before we ask for these material possessions, we should thank God for our life because a human birth by far is the biggest gift from God to us. This mantra reinforces the fact that a person who resides the reflection of Goddess Lakshmi and God Vishnu in his/her heart is truly blessed and victorious in every sense. This festival official marks an end to the Diwali festivities by reaffirming the ideology of inner enlightenment by eradicating bad habits, doshas, and all kinds of bad addictions. Obeying the shastras and following the best practices of good living one can get closer to the Almighty - who is the ultimate aim of human existence. This year this auspicious day falls on 12th November 2018 and the auspicious time to perform the Labh Panchami pooja is approximately between 6:42 am to 10:21 am. 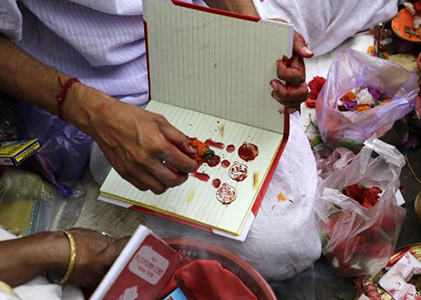 But it is advisable to get this verified by your astrologer before commencing with the pooja. So if you are looking to start a new business or grow your existing business line then this is the ideal day to jump start that with that dream and initiative.